"My servant David is a messianic ruler from the line of David who will truly be a man after God's own heart. This is clearly fulfilled in Jesus Christ" - Howard M. Ervin, notes on Ezekiel, New Spirit-Filled Life Bible, p. 1095. 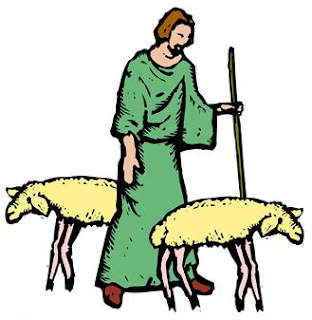 Our Ezekiel reading goes on to list many benefits of being a sheep under this Messianic shepherd. Though these are commonly viewed as prophetic and incompletely fulfilled in our time, I think they are for us too—to pray for, claim, and identify—as we examine our lives for evidences of how God has and is working. What are some of the benefits of being part of Jesus' flock? We have a shepherd—someone who cares for us and looks after us (Ezekiel 34:23,24). We are promised safety (Ezekiel 34:25). We will experience blessing (Ezekiel 34:26). Our efforts will be productive (Ezekiel 34:27a, 29). We are slaves no more (Ezekiel 34:27b,28). Are we praying for and claiming the benefits of membership in Jesus' flock now? And are we looking to the future with hope and expectation, knowing that our shepherd will one day return the earth and all its creatures to rightness? PRAYER: Dear Jesus, thank You for being my shepherd. When I can't understand what's happening in my life, help me to trust Your shepherding wisdom and ability. Amen. All quotes are taken from Journey on the Hard Side of Miracles by Steven Stiles, Kindle edition. "It can be difficult to follow the Shepherd, but it is dangerous to follow any other" p. 57. "It is not our place to understand everything the Shepherd does. It is our place to follow" p. 86. "Our spiritual growth never reaches the point where we can survive a moment without the care of the Shepherd" p. 256.